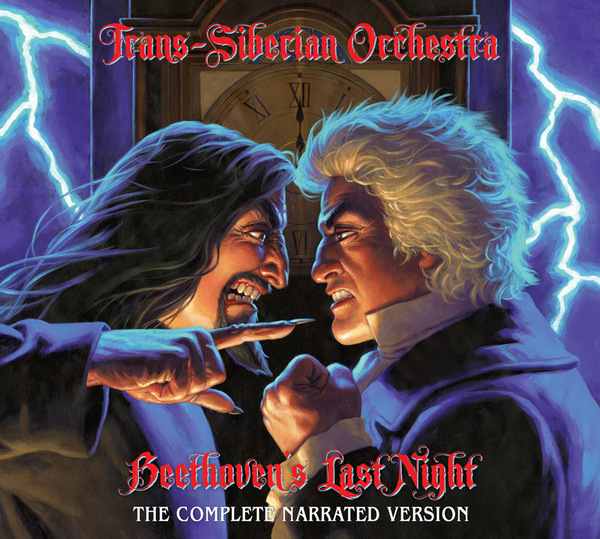 BEETHOVEN'S LAST NIGHT: THE COMPLETE NARRATED VERSION includes all of the music from the original release and, for the first time, the narration featured during live performances of the album. It comes packaged with a booklet filled with illustrations of the story, plus the full lyrics and narration. “This thing cannot be true! The cloaked figure of death rises from the floor. He offers Beethoven a bony hand. The composer backs away in terror as Mephistopheles sympathetically offers advice. The hands of the clock rotate backwards from midnight to eleven PM. Is it death well wrapped in pain? Or perhaps it’s no one will remember your name? Mephistopheles disappears back into the abyss through a hole in the floor that opens up to receive him. As it is upon our birth? If you'll just tell me where we start"
One has to know the child"
The child asked would they ever meet again? And then asked where he had been happiest? Together, Fate and Beethoven watch the composer as a young man falling in love with the Princess Theresa. What are these voices that you hear? Are they too far or far too near? What are these things that echo from the past? Who are these ghosts you see at night? So, tell me Ludwig, what should I do? Fate allows Beethoven to see all the musicians from the past that have affected his writing as well as all the musicians still unborn whose work will be inspired by him. That there would be an ever after? Do you think I'm scared? I can always hear his whispering? With everything that I am? Tell me does it show? Are you a saint or are you a fool? Is it really so much? “If Judas had you around in thirty-three A.D.
That I've never seen before? That I've not seen till this day? Could this one life really matter? Can you see it in the night? Can you feel that it's out there? It is agreed upon this night, March 26, 1827 between the undersigned, that the music of the Tenth Symphony, composed by Ludwig van Beethoven, firstborn son of Johann and Maria van Beethoven, of the city of Bonn, shall henceforth be the property of Mephistopheles. It is also understood that it is his intention to remove any signs of this music from the memory of man for all time. In exchange for the destruction of the aforementioned music it is also agreed that Mephistopheles and all his minions will remove themselves from the life of the child presently sleeping in the gutter directly across from the window of this room. This removal of influence is to be commenced immediately upon signing and to be enforced for all eternity. “Why is this symphony still here? Why does it not ignite? Tell me you gnome, what do you know? Slowly the shadows and spirits disappear. The room is now completely empty except for Beethoven who lies down on a cushioned window seat and drifts into his final sleep.